Michelle Stringer on Where did I go? Kristin on Where did I go? Sue Ernst on Where did I go? brdrobenak on Where did I go? Sonia Munson on Where did I go? Aimee Gibbs on Where did I go? The SOCRATES clinical trial has concluded with summary results having been released to the public. More detailed results will be presented at the European Stroke Organisation Conference in Barcelona, Spain next week. Ticagrelor (Brilinta) carries a retail price in the United States of over $300/month. It was not found to be statistically more effective in preventing stroke in the SOCRATES study when compared with aspirin. Source: GoodRx.com for price comparisons at retail pharmacies. The trial randomized patients with transient ischemic attacks (TIA) considered to be high risk for stroke and patients with “mild” strokes to take either ticagrelor (Brilinta), a medication that impairs platelet function currently in use the prevention of heart attacks in patients with coronary artery disease or with coronary stents in place, or aspirin. Ticagrelor was taken at a dose of 90mg twice daily, and aspirin was taken at a dose of 100mg daily (plus placebo for the second dose – patients were blinded to which drug they were taking). Patients had to enter the trial within 24 hours of their TIA or stroke symptoms beginning. The endpoints were the amount of time until a recurrent stroke, a heart attack, or death. While the patients in the ticagrelor group are being reported as having fared slightly better than those in the aspirin group, the results were not statistically significant. This means that there is no significant benefit in the primary prevention of stroke after a TIA or in the secondary prevention of stroke following a mild stroke that ticagrelor carries over aspirin. – about $300-plus per month in savings for some patients if they now opt for aspirin over a patented drug for which there is no generic equivalent. It also raises the question about whether pharmaceutical companies will fund clinical trials that cost millions of dollars to run and carry to completion in order to obtain an additional indication for a drug’s use. It’s a gamble. If companies don’t fund trials to demonstrate efficacy, then insurers are less likely to cover drugs for patients, and patients are more likely to opt for a less expensive option, if available. If they fund trials and the drug being tested is not effective, or is not superior to a less expensive option that already widely exists, then not only is it millions down the drain, but negative press about the company and the drug. However, if the drug is shown to be more effective than the cheaper, more widely available option, then the return on investment could be huge. Personally, I was shocked. Ticagrelor carries a reputation of being a potent antiplatelet medication, and many of us who treat patients with stroke or heart disease felt that this was a softball sort of trial. Of course the ticagrelor was going to win solidly – because it was being compared only to a substance that has been available over-the-counter for decades, a drug that went generic in the 1930s and whose history dates back over 2,000 years as a substance produced by the willow tree. Could it really be that something as simple and low cost as aspirin could rival an expensive, patented, relatively new prescription drug? According to SOCRATES, this may well be the case. There were limitations to SOCRATES. It’s always difficult to incorporate every possible scenario into a clinical trial, especially in a disease like stroke where each one is different. This did not test whether the combination of aspirin and ticagrelor was more effective than aspirin alone. It also did not compare ticagrelor to other antiplatelet drugs that are generic, such as clopidogrel (Plavix). Medicine is still an art, because above all, it’s important to treat each individual patient with the information available while applying good judgment. A recent study published in the journal Science Translational Medicine earlier this month has demonstrated that an extra boost of electricity to the brain may result in improved upper limb use when combined with occupational therapy sessions following either ischemic or hemorrhagic stroke. Twenty-four patients with upper limb impairment due to a stroke that had occurred at least six months previously were randomized to one of two groups. Patients in the treatment group received a small amount of direct electrical current, delivered via an electrode that was placed on the scalp over the motor cortex on the same side as the stroke. The second group of patients still had the electrodes in place, but no electrical current was being delivered. For the first 20 minutes of nine therapy sessions (one session per day, for nine consecutive days) the patients wore these electrodes. Following the 20 minute period, therapy continued as usual. The idea was to determine if a small electrical stimulus could wake the brain up, so to speak. Neuronal plasticity is the term given to the concept that following a brain injury, surrounding cells can adapt to perform functions previously carried out by the cells that were damaged in order to restore function that may have otherwise been lost. While relatively small (24 patients participated in the study), there was a statistically significant improvement in upper limb movement in the patients receiving direct electrical current when compared to patients who did not receive electrical stimulation. I always become intrigued (and excited) when options for stroke prevention or recovery that don’t involve more medications, surgical procedures, and/or significant risk to patients produce positive results, and this is such an example. This has the potential to be a sizeable step forward in producing better results with stroke rehabilitation, and larger studies are warranted. Perhaps what is most exciting is that the benefit was still seen three months later, despite patients not having not received electrical current stimulation during that time. This implies that the rehabilitation is effective and long lasting. For more information about this study, click here. #Redshoes4youngstroke: A Call to Action! One of the central missions of The Stroke Blog since it went live in October 2014 has been to provide information to those who have survived a stroke or strokes that occurred at relatively young ages. The very first post, “Deconstructing the Mini-Stroke,” recognized that while there may be symptoms more-or-less universal to some stroke types regardless of a person’s age, that the young stroke population tends to struggle differently through what I call their stroke aftermath. One problem in the young stroke population is that, while we have a drug (IV t-PA) that can help to minimize the long-term aftermath of ischemic stroke when administered within three to four-and-a-half hours of stroke onset, many young patients do not receive it. A number of my young patients have told me that when their symptoms began, they decided to take a nap or wait it out, either because stroke was not on their radar, or because even if it was, they believed stroke to be a disease of the elderly. Those who do take their symptoms seriously and seek emergent medical attention can be misdiagnosed, because healthcare providers may doubt that a stroke can occur at young ages. For hemorrhagic stroke, early medical attention can result in better outcomes for different reasons. Perhaps an aneurysm has ruptured requiring urgent surgical repair, or a hemorrhagic stroke patient requires emergent blood pressure control. When stroke symptoms develop, regardless of a person’s age, emergent medical attention should be sought. In the United States, this means calling 911 (not driving oneself to the hospital). According to the Centers for Disease Control, in 2009, almost one-third of stroke hospital admissions in the U.S. were for patients under the age of 65. The Center for Health Statistics estimates that $15.5 billion was lost in productivity in the U.S. in 2008 as a result of stroke patients having to leave the workforce. When stroke strikes a young adult, it costs these individuals personally on many fronts, but it also takes its financial toll at a national level. This is a public health problem. I want young people to know that when sudden paralysis develops in an arm or a leg, the right thing to do is to get to a hospital as quickly as possible in hopes that t-PA treatment may be a possibility. For severe strokes resulting in large artery occlusions, or “blockages,” we now have very compelling clinical trial data telling us that using a catheter to remove the blood clot is very beneficial in some patients, but only when the stroke is treated early. A delay of even a few hours may make the difference between being dependent on others for care, or returning to independence. of red shoes, or if this is too much of a financial burden, to spray-paint an old pair of shoes red. Wear them proudly. The more they stand out, the better. If you are asked about them, use the opportunity to share with the questioner that a person is never too young to have a stroke. If you have a personal story to share, I challenge you to be bold enough to share it. If you are hesitant about sharing it, then communicate to others that stroke is not a disease only affecting the elderly. Take a picture of your feet in these shoes, and post it to social media – to Facebook, Twitter, whatever. Include the hashtag #redshoes4youngstroke when you post it. Tag others in your posts whom you feel will care about this cause and participate. If you have the financial means to do so, consider making a donation to the American Stroke Association, National Stroke Association, Young Stroke, or another not-for-profit organization you feel has been supportive of the young stroke population. I will watch for interesting red shoe pictures with the #redshoes4youngstroke hashtag to come along, and will repost some of them with permission on The Stroke Blog. Moments before hitting “publish” for this post – hoping to bring more awareness around the plight of young stroke patients. I wore them a few times earlier this month while caring for patients in the hospital to see how people would react, and I received multiple comments each day from patient family members, people in elevators, other parents when I picked my son up from basketball practice. I practiced giving my 20 second spiel about a person never being too young to have a stroke, and it resulted in a number of engaging conversations. 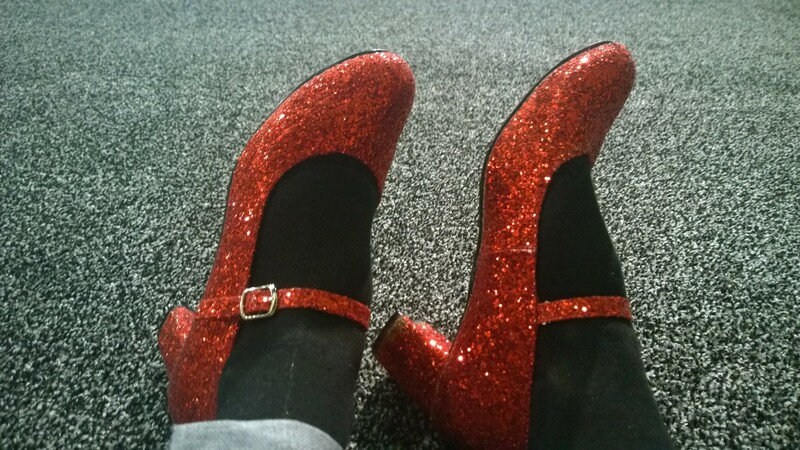 Some people even said they would join me in wearing red shoes to raise stroke awareness! I also want to thank the neurology residents at Duke University, who are not only fantastic physicians, but who have been my sounding board as I have contemplated this. They have been full of great ideas! 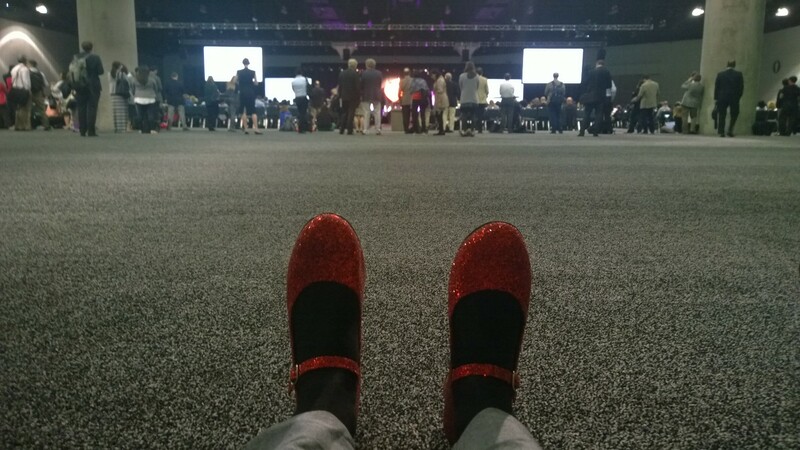 I am currently attending the American Heart Association/American Stroke Association’s International Stroke Conference, and am wearing my red shoes. I am encouraged at the response I have gotten over the course of the morning, and feel certain this can extend beyond those who care for stroke patients. With greater awareness comes greater funding for research, greater compassion for the plight of a group of survivors, and greater understanding of an issue that exists in our society. Let’s wear our red shoes! What does “blurry vision” really mean after stroke? Visual symptoms are very common following both ischemic and hemorrhagic stroke. These complaints have a tendency to receive the label “blurred” or “blurry” by both patients and healthcare providers, but an important part of accurate diagnosis and increasing the chance of improving these symptoms for the patient involves understanding what the problem is. Not all “blurry” vision after a stroke is actually “blurry”! Over time, I have found that visual deficits following a substantial brain injury tend to fall into one of the following categories. While scores of neurological conditions can result in these visual syndromes, for our purposes we will keep the focus on stroke. Diplopia, or double vision, occurs when more than one image of an object is being visualized by the patient. This occurs most commonly because the eyes are not aligning properly to fixate on a visual target, and as a result of failing to converge at a specific point, mixed visual information is presented to the brain. When a patient has experienced a stroke, most often I find that the injury was in the brainstem, as there are centers controlling eye movements in this location. Double vision can also occur if there is an injury to one of the cranial nerves controlling eye movement closer to the eye itself, even if the brainstem is not injured. Visual aura often is described as “blurry vision” by patients, but is much more complex than this description would suggest. Stroke patients may experience temporary visual illusions, such as the visualization of distorted surroundings, blurring of a crescent-shaped area or a larger section in a person’s visual world, flashing lights, wavy lines, development of “tunnel vision,” or any other number of transient visual symptoms. Fortunately, visual aura is very benign and treatable in most cases. Patients may be concerned that episodes of visual aura are TIAs, or transient ischemic attacks, that may represent the start of another stroke. I have seen people who have been taking warfarin or other big-gun anticlotting therapy for years because of “TIAs,” but when we get down to it turns out to be visual aura. This MRI was obtained from a young postpartum woman after she noticed that she was unable to see objects in the right half of her vision. MRI confirmed the presence of a left occipital and temporal lobe injury due to stroke. Homonymous Hemianopia occurs when a visual field is distorted or absent, meaning that one half of someone’s visual world is impacted. Often patients will think they have lost vision in the right eye or in the left eye, when in reality upon testing, the eyes are fine, but the right half of the person’s visual world is absent. This typically occurs with an injury to the occipital lobe, the brain’s visual processing center. Put simply, the right occipital lobe processes visual information in the left field of vision, and the left occipital lobe processes the right field. A stroke impacting the right occipital lobe may result in loss of vision in the left visual field. 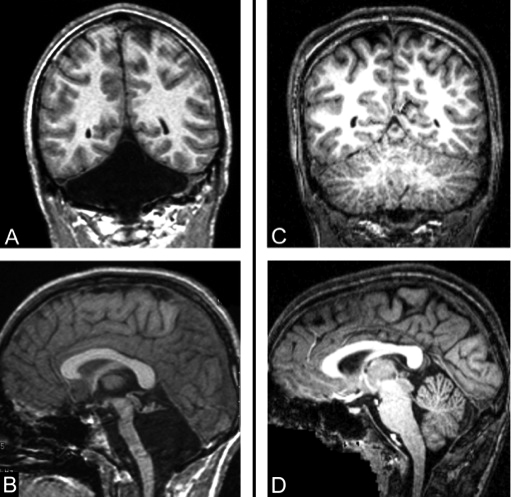 The MRI brain (figure 1) was obtained from a young postpartum woman with a left occipital infarction with hemorrhagic conversion, which resulted in loss of vision in her right visual field. Visual Hallucinations occur when a patient detects objects or movement that is not actually present. This can occur for a variety of reasons, involving either the brain or the eye. Charles Bonnet Syndrome is the name given to visual loss followed by the brain “filling in” missing visual information in the form of hallucinations. I have seen cases where the hallucinations are pleasant (a cuddly appearing kitten), and cases where they are disturbing (large insects). If visual hallucinations are present after a stroke, I always think it is worth performing an electroencephalogram (EEG) during the hallucination to better exclude seizure activity in the area of injury. Oscillopsia is present when a patient perceives that objects at rest are “swaying” back and forth when movement is not actually present. This can occur with brainstem or cerebellar stroke, but I have seen it in other locations as well. Patients without stroke may experience this visual phenomenon with benign paroxysmal position vertigo (“inner ear” vertigo, as a lot of patients describe it) or with migraine as well. Cortical Blindness typically involves injury to both occipital lobes. Patients lack vision, even though the eyes may be healthy. This can be devastating for patients, as these are typically patients who have always relied on vision who abruptly become blind without warning since stroke is usually of sudden onset. I attended an event in 2013 (Dining in the Dark) in which a nice dinner was served to us as we wore blindfolds. Have you ever considered how heavily you might depend on your vision to get through simple tasks, such as a meal? It gave me tremendous appreciation for what patients with cortical blindness after stroke must experience – to have vision one day, and for it to be gone the next is difficult to imagine. To make things even more challenging, some patients with cortical blindness develop Anton Syndrome, which involves blindness without the recognition that blindness exists. Now can you imagine everything around you seeming real, but none of what you are visualizing is actually there? Finally, there is vision that is truly blurry. Regardless of the stroke’s location, patients often complain that their glasses prescription does not seem correct any longer. They may obtain a new prescription after the stroke, only to find that it is no longer accurate six weeks later. A neuroophthalmologist (this is a neurologist or an ophthalmologist who specializes in visual problems after a brain injury) can be helpful here, but it takes patience from both patient and physician as symptoms tend to fluctuate. Want to participate in a clinical trial? Try clinicaltrials.gov! There is still a vast amount that remains unknown in the world of stroke treatment, particularly when it comes to managing what comes after the initial hospitalization and rehabilitation process. Fatigue, pain, insomnia, anxiety, depression, spasticity, walking deficits, headaches, dizziness, visual symptoms – sometimes our typical approaches to managing these symptoms do not seem to be as effective after a brain injury. For example, patients with thalamic pain syndrome after an injury to a part of the brain known as the thalamus often struggle with uncomfortable pain, tingling, burning, and/or a sensation of “tightness” around an arm or a leg, and they may quickly exhaust all of the available options. Medications that are generally effective for many painful conditions frequently fail to provide relief for this patient population. Once healthcare providers and patients are both out of ideas, the question about available clinical trials arises. Clinicaltrials.gov contains information on more than 206,000 clinical studies. Clinicaltrials.gov is a fantastic resource available for physicians, investigators, and patients, but the problem is – many patients are unaware of its existence. It is a registry of most clinical trials involving human subjects in the U.S., and also includes information about thousands of trials taking place in other nations. Currently, the site contains information about more than 206,000 studies! If one is seeking study information on Fabry disease, a relatively rare genetic disorder that can result in stroke at a young age, as of this post’s publication date 102 results were identified from searching on the term “Fabry.” Nations outside of the U.S. have also created their own registries. In Europe, for instance, the EU Clinical Trials Register serves the same purpose. Similar registries are available in South Korea, Japan, and Australia, to name a few others. If you feel you are out of therapeutic options, regardless of what medical situation you may face, I encourage you to try an easy search through an online clinical trials registry. This information is free of charge, and can empower patients as they navigate through complex conditions and symptoms. Type the name of your diagnosis in the search bar, regardless of how rare it is, and allow yourself to explore. Not only might it be beneficial for you as a patient to consider a clinical trial if there are no known answers, but the more willingness there is on the part of patients, physicians, and investigators to participate in research, the sooner the answers that have evaded us will come. Just after New Year’s Day in 2013, I was asked by a local news station about a story in the mainstream media involving a “blood clot in the brain.” At-the-time Secretary of State Hillary Clinton had fallen and hit her head, and this was followed soon afterwards by a diagnosis of a blood clot “in the vein between the brain and…skull,” according to this news article. I recognized over the following week while the story played out in the news that, while Clinton’s clot was not the same thing as one might think of an ischemic stroke, there was little understanding outside of the medical community of how her neurological issue differed from the large majority of blood clots in the brain. I even received several questions about it from patients, the most common one being – did Hillary Clinton have a stroke? And my answer was – not exactly. Ischemic strokes, as we think of them, involve an obstruction in an artery that is preventing oxygen-rich blood from reaching its target destination within the brain. Arteries can be blocked by blood clots, plaque accumulation within the wall of the vessel, a torn lining in the wall of the artery (dissection), or even overgrowth of cells within the blood vessel wall (hyperplasia). Veins, on the other hand, drain blood away from the brain and back to the heart once the oxygen has been extracted from it. Veins of significant size in the brain are called venous sinuses, as they are structured more like collecting pools for the drainage of blood that is no longer rich in oxygen. 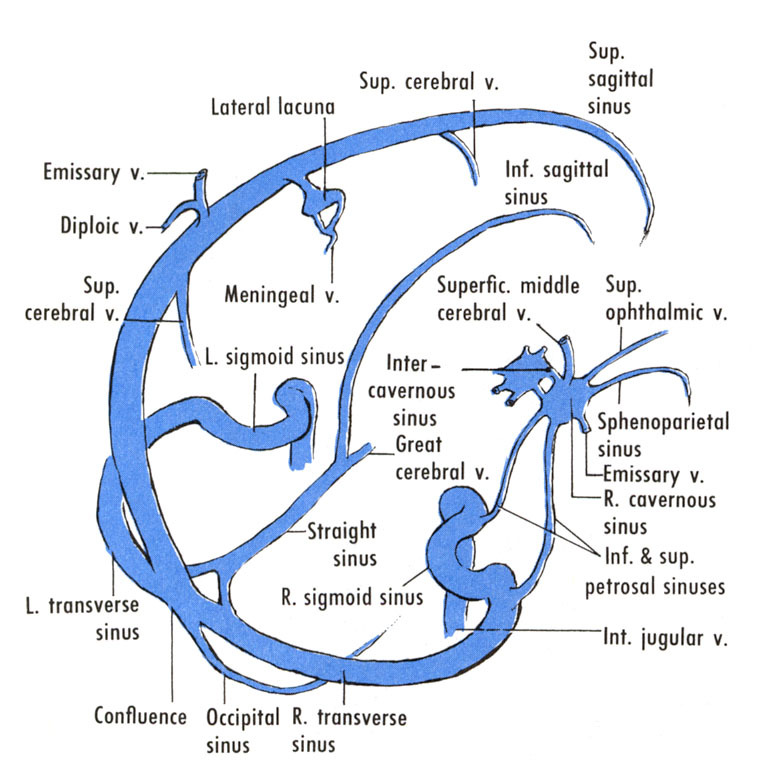 A clot that occurs in one of these venous sinuses are known as a cerebral venous sinus thrombosis (CVST). It is much less common to develop an obstruction blocking blood flow in one of the brain’s veins than it is within an artery. According to the scientific statement published by the American Heart Association/American Stroke Association in 2011, only 0.5 to 1 percent of strokes result from a blood clot in a cerebral vein. People might be familiar with the concept of a venous clot, such as in a leg if one sits in a car or on an airplane for a prolonged period of time. However, venous clots can occur anywhere in the body, including in the brain. Various factors may lead to increased risk of clotting in one of the venous sinuses or in a cerebral vein. It is important to understand that in all of us, our blood is in a constant state of flux. Just as the American government is set up with checks and balances such that the branches can more-or-less keep each other in check, our blood has millions of molecules pushing it towards clotting, and millions breaking down clots. We need to clot so we do not hemorrhage. Yet, our blood needs to be able to flow to our organs, and if it can’t because of extensive clotting then heart attacks, strokes, and other catastrophes develop. There are certain genetic mutations that can cause blood to clot more readily, such as the factor V Leiden mutation or the prothrombin mutation. There are people who lack certain proteins that assist with breaking down clots, and in the absence of these proteins clots are more likely to develop. Deficiencies of protein C and protein S are two of the more common examples of this. Autoimmune disorders can increase the risk for clotting in general, such as can be seen with lupus and antiphospholipid antibody syndrome. The use of certain types of birth control pills can cause elevated risk of CVST, as can pregnancy, because elevated estrogen levels have been associated with thrombosis. Cancers and systemic infections/sepsis can cause massive hemorrhaging or diffuse clotting. Significant concussions or skull fractures can also result in CVST. The most common initial symptoms of CVST are headache, visual changes, and/or seizure. A headache that continues to escalate for days to weeks, especially in a patient taking birth control pills, who is pregnant, or who has a history of abnormal clotting should undergo MRI of the brain. Standard MRIs are sensitive enough to detect most CVST, but if there is any question an MR-venogram or a CT-venogram of the head should be performed. If CVST is identified, the treatment is an anticlotting medication. Warfarin is the most common medication used for this, although rivaroxaban (Xarelto), apixaban (Eliquis), and dabigatran (Pradaxa) have been used more recently as off-label agents. In pregnant patients, enoxaparin (Lovenox) is typically used because it is thought to be safe (pregnancy Category B). Warfarin is known to cause birth defects (pregnancy Category X), and the effects of the other oral agents on fetal development is unknown at this time. Warfarin can be used safely in breastfeeding mothers once the baby is delivered. In my experience, patients with CVST do very well clinically once started on an anticlotting therapy, especially if the clot is identified early. Secretary Clinton’s treating physician claimed in this news article that she had a clot in the transverse sinus. The nice thing about transverse sinuses is that there are two of them, and when one is blocked due to the presence of clot, blood is usually still able to drain from the brain. Her physician also noted that she had a deep venous thrombosis (DVT) in the 1990s, suggesting she might be at risk for clots. If people are at particular risk for clot formation, being dehydrated does not help (Clinton was reported to have influenza during that time), as the blood becomes more concentrated. While he described the condition as “potentially life-threatening,” in the dozens of transverse sinus thromboses I have treated, none of these patients have died, and the recovery is very favorable. Even patients with very large superior sagittal sinus thromboses do very well typically if recognized early and started on therapy. When making a determination about whether a patient has had a stroke if an artery is blocked, we require that some degree of damage has occurred in the brain before calling it a stroke. If there is no damage and the patient has no lingering symptoms in this scenario, then the diagnosis of a TIA, or transient ischemic attack, is made. In the case of CVST, if diagnosed and treated early and lacking any evidence of damage to the brain, it probably should not be labeled as a stroke either. While it may be convenient to throw all CVST cases in the “stroke” bucket, many of these patients will not sustain permanent brain injury, and will go on to lead productive lives without lingering evidence that such an event ever occurred. So did Secretary Clinton have a stroke? I stand by my answer of – not exactly. Would I expect something like this in Secretary Clinton’s medical history to prevent her from carrying out the duties of the presidency if she is elected in November? No more than migraines would have stood in Michele Bachmann’s way in 2012, or than atrial fibrillation would have prevented Bill Bradley from performing presidential tasks. By the time adults reach their 50s or 60s, it is almost an inevitability that a health condition of some sort will be present. If we want candidates for president in near-perfect health, we could change our laws and elect a very young person as our commander-in-chief, but then we lose the presence of life experience. Some of the topics I spend the most time discussing with patients and their families who are facing the aftermath of stroke have nothing to do with actual medicine. Medical school, residency, and fellowship provide the opportunity for physicians to learn that drug A treats condition B, and that we use drug C because Clinical Trials X and Y suggested it is beneficial. When physicians enter the world of clinical practice, while our patients depend on us to guide them in making decisions that impact their health, they also want to answers that physicians are not formally trained to answer. Personally, the non-medical topic I find myself discussing the most frequently with stroke patients is the process of applying for disability income in the United States. The first time a patient asked me why she was turned down for social security, I had no idea. She clearly was physically disabled from her stroke. I had completed the appropriate paperwork sent to my office. I could see she was visibly upset at being denied this needed income, and I felt guilty, as if it was my fault in some way, despite having meticulously completed the forms. What happened? Fast forward to 2015, and I think I have gained more insight into why this scenario occurs. My disclaimer here is that I am not an attorney, employed by the federal government, or a certified account, so what I am sharing is what I have gained watching hundreds of stroke patients navigate the process. Patients frequently do not understand how the system works, and many healthcare providers don’t either. To be perfectly frank, I am naïve to all of the inner-workings of “the system,” but I can boil it down to a few key points that I hope will provide clarity to anyone out there living with neurological deficits after stroke and seeking answers. If a long term disability insurance policy was purchased prior to the stroke from a company such as The Hartford, MetLife, or Liberty Mutual (these are only a handful of carriers out of the many available), then an application can be filed. The patient’s healthcare provider, usually a physician, will be asked to complete paperwork, and copies of relevant medical records will be requested. Typically there is a waiting period, which is variable. If a patient has short term disability insurance, income from the short term disability policy can be used for part or all of the waiting period until the long term disability income is available. If there is no short term disability policy in place and no sick leave available, there is usually a lengthy unpaid period as the patient waits. If a patient improves over the course of the waiting period, even if a long term disability policy is present, the patient may not be eligible to receive income if the level of disability cannot be verified in the medical records or from the paperwork completed by the healthcare provider. Then, there is social security. This has to be one of the most misunderstood systems in the U.S. Patients have so many different ideas of what social security is, how it works, how one receives benefits, and so on. The National Stroke Association does a fantastic job of breaking down social security on its website. Click here if you would like to read more. In the example I mentioned above, the reason the patient was denied social security income was not because she was not physically disabled, but because her stroke was less than one year old. Her stroke was too recent. The condition has to be expected to last “at least 12 months.” My advice to stroke patients who have been denied social security income if they applied less than one year after the stroke is to reapply. If a patient is already receiving social security income because of his or her age (let’s say – a 70 year old patient who has been receiving social security income for five years), then the patient is already receiving the money! People do not receive double the amount of money for becoming disabled over the age at which they become eligible to receive social security income. If an adult has never worked, or worked but somehow never paid into the program, or if a person worked but did not contribute enough to the program while working, then a person is probably not eligible to receive social security income. If there are questions about your personal situation, I recommend contacting an attorney with expertise in this area. It’s important for patients to understand that social security is an annuity, meaning that people pay in to the program as an insurance policy. In return, money is paid out, either when a person becomes disabled or when a person reaches retirement age. Due to the number of readers of The Stroke Blog who have identified themselves as having experienced carotid or vertebral artery dissections with or without stroke, I believe a clinical trial from the United Kingdom is very much worth sharing here. 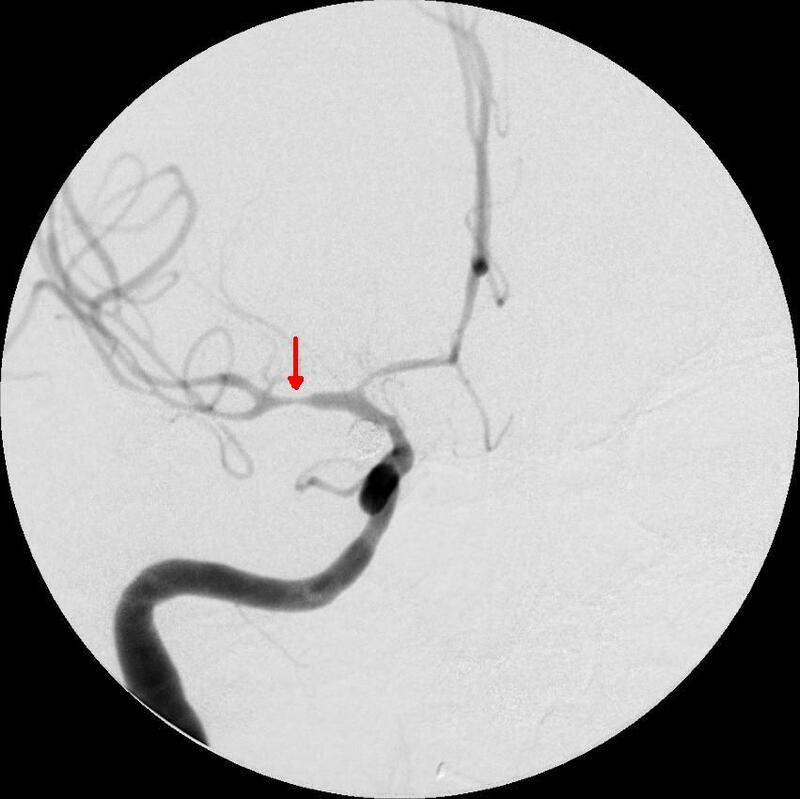 The Cervical Artery Dissection in Stroke Study (CADISS – Markus HS, et al) set out to answer a question that has existed for many decades in the world of stroke management. When a dissection (a tear in the innermost tissue layer of an artery) of a carotid artery or vertebral artery (arteries in the neck that bring blood to the brain), how is a stroke best prevented going forward? In patients who have already had a stroke at the time the dissection is diagnosed, the goal is certainly to prevent further strokes from occurring. If a patient has not already sustained a stroke, then sparing that person a permanent brain injury is the top priority. It has not been entirely clear how to achieve these goals though. Should a patient be treated with antiplatelet agents (medications impairing platelet function), such as aspirin, clopidogrel (Plavix), another antiplatelet agent, or some combination of these? Or should a patient be treated with anticoagulation, a drug that actively prevents clotting, such as warfarin (Coumadin) or heparin? I have heard many arguments on all sides. Some neurologists say that antiplatelet therapy is just as effective as warfarin but carries a lower risk of hemorrhage. Others say that antiplatelet therapy is not aggressive enough and anticoagulation with warfarin or heparin (or both) should be used. Some say to start on antiplatelet therapy or anticoagulation and if symptoms get worse to switch to whatever therapy was not initially used. Others argue for placing a stent in the dissected artery. Until recently, there was no clinical trial actually comparing antiplatelet therapy to anticoagulation in patients with carotid artery or vertebral artery dissection, and the medicine selected for treatment was based entirely on anecdotes and the bias of the treating physician. In the CADISS trial, patients presenting to one of the participating medical centers in the United Kingdom who were diagnosed with carotid or vertebral artery dissection (with or without stroke) believed to have occurred within the seven days prior to presentation were randomized. Half of the patients were started on antiplatelet therapy, and half were placed on anticoagulation. The duration of treatment was three months. The endpoint was to determine how many strokes or deaths occurred in each group. Whether or not the patient had already had a stroke before enrolling in the trial, the endpoint was to see, once antiplatelet therapy or anticoagulation was started, how many patients went on to have strokes despite that therapy. The CADISS trial, published in Lancet Neurology in April 2015, did not find a statistically significant difference in stroke prevention in patients presenting with acute carotid or vertebral artery dissections when treated with either antiplatelet therapy or anticoagulation. Two hundred fifty patients were enrolled (118 carotid artery dissections and 132 vertebral artery dissections). Interestingly, 52 of these patients were not found to have carotid or vertebral artery dissections when their radiology studies were carefully reviewed as part of the study, despite initially receiving that diagnosis. Of the 198 patients remaining, there was no significant difference in strokes between the two groups. There was one episode of symptomatic bleeding in the anticoagulation group (subarachnoid hemorrhage, or bleeding in the brain that occurs when an artery in the brain ruptures). There were no deaths in either group. Of the 198 patients with radiological evidence of dissection confirmed, there were only four total strokes following initiation of the designated medical therapy in both groups combined. The CADISS trial began as a feasibility study – a trial to see if it was even feasible to enroll enough patients with a condition not diagnosed with frequency in the emergency department. This phase of the study was statistically sound and convincing enough not to proceed with a larger trial. 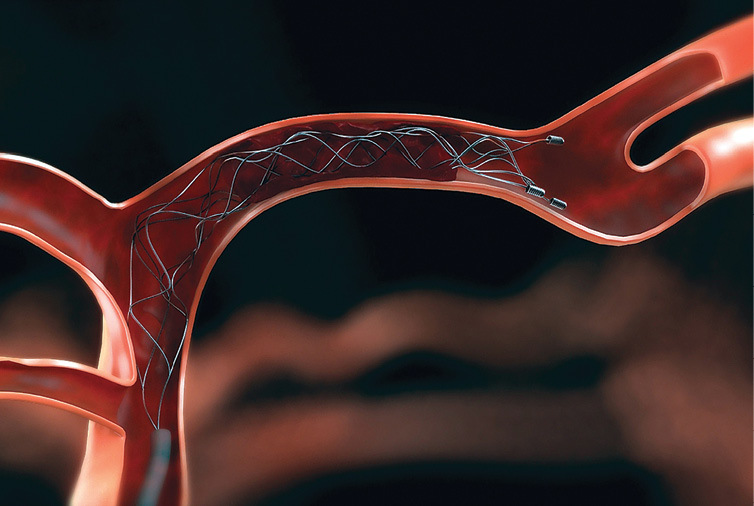 A trial comparing stenting to medication alone has not been performed, and given the low number of strokes in patients on medical therapy in the CADISS trial, it is unlikely that a dissection stenting trial will be performed any time in the near future. For more details about arteries bringing blood to the brain and about carotid and vertebral artery dissection, please refer to a prior post on The Stroke Blog by clicking here. The overwhelming majority of patients with carotid and vertebral artery dissection, if started on either antiplatelet therapy or anticoagulation soon after the dissection has occurred, will not go on to have a stroke while on therapy during the aftermath following the vascular injury. There is no significant difference in stroke prevention in patients with carotid and vertebral artery dissection between those using antiplatelet medications and those using anticoagulation. The trial does not address the myriad symptoms many dissection patients notice lingering after the injury – migraines, neck pain, and anxiety, to name a few. One trial cannot address every possible issue associated with a medical condition. However, physicians who care for young stroke patients with this particular vascular injury should be celebrating the fact that we finally have evidence-based guidance for preventing stroke in these patients. Intravenous (IV) t-PA, a “clot-busting” drug approved by the FDA for the treatment of acute ischemic stroke within three hours of the start of symptoms, has been recognized as the standard of care since the pivotal NINDS clinical trial that demonstrated reduced level of disability 90 days after ischemic stroke in eligible patients who received it. However, the subject of acute treatment with the use of thrombectomy has remained controversial until recently. Thanks to recent clinical trial results, the American Heart Association/American Stroke Association guidelines have now been updated recommending the use of this procedure in eligible patients meeting appropriate criteria. What, if anything, can be offered to patients who are not eligible for IV t-PA, but who still present to the hospital within hours of stroke onset? What should be done for patients who have received IV t-PA, but who are failing to improve clinically, and there is a known blood clot that remains in a major artery of the brain? A mechanical thrombectomy is a procedure performed with a catheter (a specialized type of wire) with the intention of physically removing the clot if it is not dissolving on its own or with the assistance of IV t-PA. A mechanical thrombectomy can be performed either with or without the administration of a dose of t-PA directly from the catheter within the artery at the site of the clot. offering patients these procedures in the acute stroke setting, the outcomes trials were discouraging, largely failing to show improved functional outcomes for patients than they could achieve with IV t-PA. This has changed in the past year though. Five papers have been published within this timeframe showing improved functional outcomes with mechanical thrombectomy with early therapy intervention. 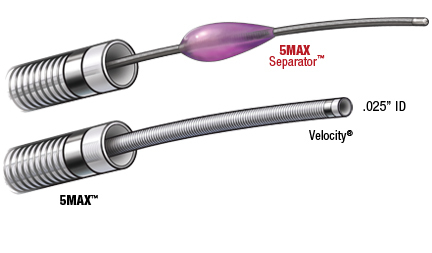 The newer retrieval devices involve the use of wire stents to extract the clot, and the result has been less time required to open the artery to restore flow to the brain. A key difference between these more recent trials and the failure to demonstrate improved outcomes in previous mechanical thrombectomy trials is likely due to the more rapid restoration of flow. The mantra of “time is brain” still holds true. The recent trials have shown what is possible when a team of healthcare professionals collaborate effectively to start the procedure as soon as possible. While thrombectomy may have been available for years, waiting on a key person to become present when the others are ready to start creates delays. The updated guidelines from the American Heart Association/American Stroke Association emphasize the importance of continuing to treat patients with IV t-PA who are candidates for the drug. After all, IV t-PA can be administered quickly, its benefit has been proven, and it should not be withheld in eligible candidates. However, mechanical thrombectomy with stent retrieval devices provides another tool in the battle against acute ischemic stroke. The traditional teaching about the role of the cerebellum has typically been that it coordinates movements and “fine tunes” them. It provides balance when walking, and stability of a hand when reaching for a glass of water. When the cerebellum sustains an injury or is malfunctioning, then the result may be gait disturbance, falls, dizziness, or tremor. The ideas above are what I learned in high school biology, in anatomy, and in physiology. Even throughout my neurology residency training, I largely thought of the cerebellum as a structure that provided balance and fine tuned movement. It has interested me during my time in clinical practice to witness the fallout from cerebellar stroke, particularly in the younger stroke population, because it is often far beyond balance and movement. Yes, the symptoms mentioned above are often present in some form when the cerebellar stroke occurs, perhaps along with a headache and/or nausea. However, the patients who struggle with recovery for months or years following a cerebellar stroke often complain of symptoms that do not fit with the traditional concepts of what the cerebellum is supposed to be doing. – Many struggle with the same cognitive symptoms that patients with strokes injuring the frontal or parietal lobes experience, such as difficulty with focus and multitasking, and because of this, they complain of difficulty with short term memory retention. – Other cognitive symptoms may exist as well, such as feeling overstimulated, or having difficulty following a conversation in a group of people. – Difficulty with language fluency (aphasia) has afflicted cerebellar stroke patients in my own experience, and their frustration after being denied disability benefits is palpable. – Some cerebellar stroke patients express that they are unable to dream any longer, or that when they close their eyes to picture a scene – being at the beach on a breezy day, or running through a field of grass and flowers – they are unable to mentally visualize such a thing. – Sometimes their significant others claim these patients have demonstrated changes in their moods or personalities, and that their relationships seem different since their strokes. Last month, as I was driving home from work one evening, I heard this segment on National Public Radio’s All Things Considered, and I thought – yes! I have to share this on The Stroke Blog with readers! This piece summarizes the complexities of the cerebellum so well for the public, and I hope those of you who read this will take a few minutes to listen to the segment if cerebellar injury is of interest. The piece features Jonathan Keleher, a 33 year old man who was born without a cerebellum. In the segment, it is explained that Mr. Keleher struggles with emotional complexity, language, and other cognitive tasks beyond imbalance and impaired motor skills. However, because he received intensive physical and speech therapy at a young age while lacking a diagnosis, he was able to demonstrate the wonder of neuronal plasticity – the ability to utilize other parts of the brain to accomplish tasks normally dependent on the cerebellum. He walks independently, and he works in an office environment. He lives independently. 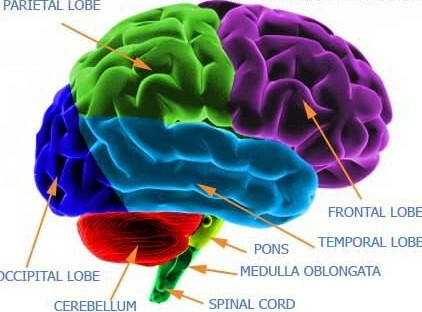 We like to believe that each function is neatly packaged within a certain compartment of the brain. Patients often ask: “If my stroke was here [pointing to a specific part of the brain], then what problems should I expect to have?” While some structures in the brain correlate more or less with certain functions, it really is not that simple, as evidenced by the complexity of the cerebellum, and by what a young man who lacks one has been able to accomplish in its absence. The brain is a large community of cells, an interdependent network that makes us who we are, and which enables us to survive from one second to the next. When I published the above blog post on cerebellar stroke in 2015, I never dreamed that it would become the most frequently visited page on The Stroke Blog day after day. The comments readers have posted in response to it, and the emails I have received from patients and their loved ones, have underscored the need for more resources about cerebellar stroke. I have heard you, and am working currently to create such a resource beyond a blog post. Stay tuned. Cerebellar stroke can be more difficult to accurately diagnose because the symptoms frequently don’t scream “Stroke!” the way that weakness on one side of the body or a facial droop may. I have seen cerebellar stroke patients in the acute setting diagnosed with migraine, benign forms of vertigo, intoxication, and substance abuse. When diagnosed early, situations leading to cerebellar stroke can be successfully treated with better outcomes for patients. Awareness of cerebellar stroke in both the community and amongst medical providers is critical for earlier diagnosis and more optimal management. It occurs at least every other week in my own clinical experience. 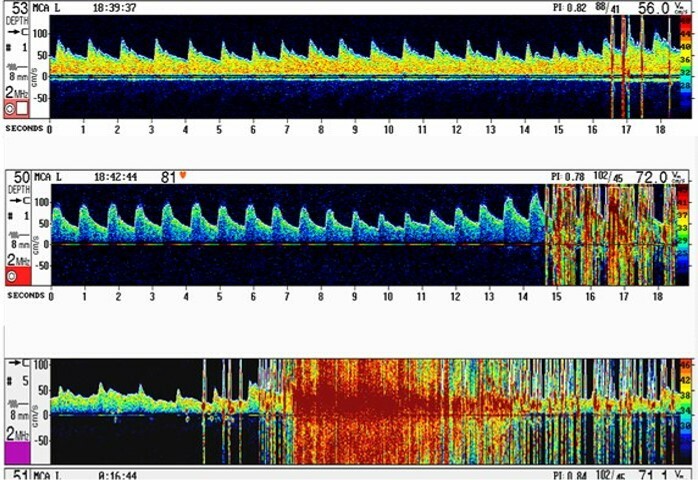 A patient has experienced an ischemic stroke, and after a workup that fails to show significant atherosclerosis (“hardening of the arteries,” “plaque build-up”) in the arteries leading to the part of the brain injured by the stroke, and without obvious risk factors that could have resulted in stroke, an echocardiogram identifies the presence of a patent foramen ovale (PFO). Often patients are told a PFO is a “hole in the heart,” allowing clots to reach the brain that would otherwise end up in the lungs as their final destination. I see in their notes: “Stroke caused by PFO.” Some patients arrive to the appointment, already having determined they want their PFOs closed, and others have already concluded just the opposite – no “heart surgery.” The majority feel lost and are seeking answers. What is a PFO, and what is the significance of it? The purpose of this post is outlined in the title – to remove some of the mystery from the PFO, although its potential effects and clinical associations with it are, indeed, still mysterious. A foramen ovale (“FO” – if you will) is a very normal part of a fetus’s heart. When we are fetuses, prior to taking our first breaths as our developing lungs remain collapsed, blood bypasses the lungs and receives oxygen from the placenta. As blood enters the right atrium of the heart, it can bypass the lungs by traveling through the foramen ovale, an opening connecting the right and left sides of the heart. After reaching the left side of the heart, blood can then proceed to travel through the left atrium, then the left ventricle, and finally exiting the heart through the aorta. Other features of fetal circulation exist to enable blood to more efficiently reach the placenta, such as the ductus arteriosis, which allows blood to stream from the pulmonary artery directly to the aorta rather than first having to visit the lungs. A “FO” becomes a “PFO” (“patent” merely means “open”) when that opening between the right and left sides of the heart fails to close completely. A PFO is not a congenital heart defect. This is an important piece of information for stroke patients found to have a PFO to understand. Many of them arrive at their appointment, believing there is something wrong with their hearts. It is a normal part of fetal circulation to have a foramen ovale. PFOs are common. Population studies indicate that 20-25% of people have a PFO, and the overwhelming majority of them will never experience a stroke related to this opening between the right and left atria in the heart. However, when younger people with cryptogenic ischemic stroke (stroke without an identifiable cause) are screened for PFOs, one is found in about 40% of patients being evaluated. This finding has been confirmed in multiple studies. Screening for PFOs. Typically, a PFO is identified on an echocardiogram, which is an ultrasound study of the heart. Sometimes if there is significant blood flow through the PFO this can be identified on a standard echocardiogram. However, much of the time this is found after a bubble study, or agitated saline injection is performed. The patient has an IV in place in the antecubital region (between the arm and forearm, in the arm opposite the elbow). A small amount of air is mixed vigorously with saline to create numerous small bubbles and then this is injected through the patient’s IV. 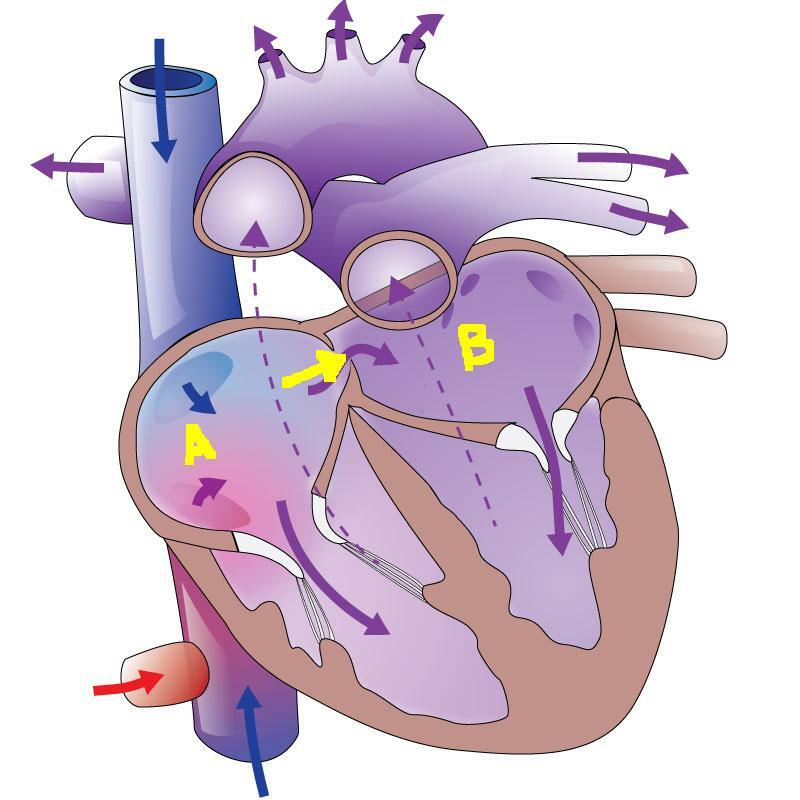 If a patient does not have a PFO, the bubbles will be visualized under ultrasound as entering the right atrium of the heart, but do not enter the left atrium because they have traveled to the lungs, which filter them. However, if a PFO is present, in many cases bubbles will be visualized entering the left atrium. Typically two injections are performed: one at rest, and one following the Valsalva maneuver, which involves bearing down/straining, as if lifting a heavy load or having a bowel movement. This maneuver increases return of blood to the right atrium, and a PFO that may not be significantly shunting blood to the left atrium at rest may suddenly enlarge when increased filling takes place in the right atrium, so the bubble test may be more dramatic. There are limitations though. Breast tissue, obesity, and other factors may limit the viewing capabilities through the chest wall to detect bubbles in the left atrium. Sometimes, for no obvious reason, the study is just not of the quality needed to determine if a PFO is present. A transesophageal echocardiogram involves sedating a patient and inserting the ultrasound proble down the patient’s esophagus for a different view of the heart. This is thought to be a more sensitive study. The limitation to this test is that a sedated patient typically cannot be engaged in the procedure to voluntarily perform the Valsalva maneuver, so a PFO that is only a significant presence during such a maneuver may be missed. Transcranial Doppler is a study using ultrasound that measures blood flow within the major arteries of the brain. The same bubble study described above during an echocardiogram can be performed while blood flow is monitored in the middle cerebral arteries of the brain, and the detection of microemboli (small “blips” heard during monitoring) following the injection indicates that some form of passage from right-sided circulation to left-sided circulation is taking place. The limitation here is that pulmonary shunts, or vessels carrying blood directly from arterial to venous circulation within a lung, can also give a positive bubble test since transcranial Doppler does not involve the direct visualization of bubbles. However, signals are detected later than expected if the shunting is occurring in the lungs (more cardiac cycles following the injection than the timing of when signals from bubbles crossing through a PFO would be heard). Transcranial Doppler is sensitive in detecting a PFO, and if consistent with this should be followed up with an echocardiogram, if not already performed. If a PFO is detected, what then? This can be a challenging question to answer, in part because it is impossible to prove whether the PFO actually played a role in the stroke, or if another factor was at play and the PFO is just receiving the blame unnecessarily. The question of whether to continue a stroke patient with a PFO and without another obvious cause of stroke on medical therapy or to close the PFO has been tested in at least two randomized clinical trials – CLOSURE I and RESPECT. The CLOSURE I trial failed to show a significant benefit to PFO closure over medical therapy. However, CLOSURE I enrolled patients with either evidence of stroke on brain imaging or patients with “TIA.” The reason I place the term TIA in quotes is because more than half of the consults I see for diagnosis of “TIA” do not turn out to be actual TIAs, but migraines, seizures, or other conditions that mimick TIAs. The point here is that many neurologists argued that the validity of CLOSURE I results was negatively impacted by potentially enrolling patients into the trial with PFOs who had not actually had a vascular event, and that this may have skewed the data. The RESPECT trial randomized young patients with PFOs and who sustained strokes without a known origin to either receive “best medical therapy” or to undergo PFO closure in addition to remaining on “best medical therapy.” There was no significant difference in stroke outcomes between the two groups, but may have been some benefit in patients with large PFOs or with aneurysmal atrial septum. RESPECT was a trial randomizing only relatively young stroke patients with PFOs (no TIAs were included – there had to be evidence of stroke on the patient’s neuroimaging) who lacked another apparent source for the stroke to either PFO closure plus medical therapy, or medical therapy alone for stroke prevention. The overall trial failed to show benefit to PFO closure over medical therapy alone. However, in a secondary analysis, patients who had large PFOs or who had a finding known as an atrial septal aneurysm (very mobile wall separating the two halves of the heart) did show more potential benefit for stroke prevention from PFO closure and medical therapy than from medical therapy alone. What is medical therapy? Medical therapy refers to any non-invasive therapy measures taken, in this case – to reduce the risk of another stroke. For patients with small PFOs and no history of stroke, this usually meant aspirin daily. For patients with atrial septal aneurysm, there is some data suggesting a relatively high risk of stroke recurrence on aspirin, but that anticoagulation may be more beneficial. I have found that the type of “best medical therapy” recommended to a patient often plays a role in his or her decision regarding PFO closure. Patients are often more willing to take aspirin daily over undergoing PFO closure, but many young patients are not thrilled with the idea of anticoagulation and the risks it carries over the long term. It is mostly performed now via catheterization with an implanted device sealing the opening between the right and left atria. The procedure typically lasts less than one hour from start to finish, and patients usually go home from the hospital the following day. At some hospitals, they may even return home on the same day. There are potential complications to a PFO closure, including bleeding, infection, and the potential for atrial fibrillation, an irregular cardiac rhythm that can generate clots and result in stroke. Based on data from RESPECT, the incidence of atrial fibrillation did not differ significantly between the PFO closure group and the medical therapy alone group. Following the publication of RESPECT trial results, PFO closure remains a topic of controversy in the field of stroke prevention and is still heavily debated. We live in a stressed out society. With greater pressures to be top performers in terms of productivity in the work place, as parents, as partners or spouses – something usually has to give. I find that one activity that becomes curtailed for many headache sufferers is sleep. “There just aren’t enough hours in the day!” How many times have I heard this statement, or some variation on it, when headache sufferers seek assistance from a neurologist? Even when headache sufferers are able to achieve eight hours of sleep each night, often the quality is poor. Bedtime is 1oPM, with full sleep onset at midnight or 1AM, and then it is time to start the day again at 6AM. Or just as common – a sleep aid medication brings the onset of sleep at 10PM or 11PM, but then at 4AM the person awakens again, fretting over the upcoming demands the new day promises. I have found that it has become routine for many patients suffering with headaches to write them off, since stress and sleep deprivation so often play significant roles. Perhaps over-the-counter NSAIDs are utilized, and then chronic daily headaches from analgesic overuse may develop. These may also be discounted, because headaches are present so frequently that pain becomes something to which some grow accustomed. There is one headache that patients never attempt to explain away though. It it brutal. This headache declares its presence in such a severe, attention-grabbing, dramatic way that it will not allow itself to be ignored by the person suffering from it. It is known as the thunderclap headache. As the name suggests, these are unimaginably intense headaches that start very suddenly and with little to no warning, as a clap of thunder might occur quickly after lightning strikes. If a person experiences a headache like this with no prior history of thunderclap headache, a call to 911 (or another emergency service if outside of the United States) is warranted. This headache, until proven otherwise, can occur with subarachnoid hemorrhage, or bleeding in the brain that takes place due to a rupturing/ruptured aneurysm or other abnormal blood vessel. Emergency medicine providers obtain head CT scans on patients entering the emergency department with complaints consistent with a thunderclap headache. This is taught to medical students as “the worst headache of someone’s life.” CT scans of the brain, while carrying realtively low sensitivity for detecting early ischemic stroke, are quite good at identifying the presence of hemorrhage in the brain. A normal head CT scan and perhaps a lumbar puncture may both be utilized to better exclude that a leaking or ruptured aneurysm in the brain is present. When everything is normal, what then? Reversible cerebrovascular vasoconstriction syndrome, or RCVS, occurs when arteries within the brain constrict, spasm, or “squeeze,” as I tell patients. When arteries constrict in this way, blood flow can become restricted to areas downstream within the brain. For this reason, there is a risk of ischemic stroke with this syndrome. There is also a risk of hemorrhagic stroke. If the constriction grows severe enough a vessel may rupture. For most patients, though, the syndrome is characterized by the thunderclap headache without stroke. A workup will fail to reveal evidence of an aneurysm or other vascular abnormality, but if imaging of the arteries is performed using catheter angiography, arteries in the brain will appear “kinked,” “narrowed,” or “beaded.” Once symptoms stabilize, if imaging is repeated, the arteries should return to a normal appearance, hence the reversible part of the syndrome. It is only the vascular narrowing that is reversible though. If an ischemic or hemorrhagic stroke has occurred, brain injury is permanent. 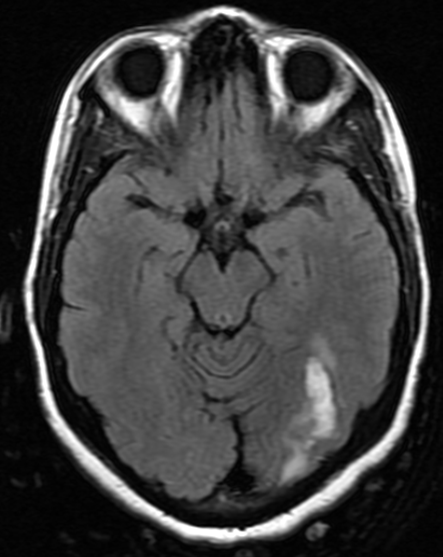 Sometimes patients seeking medical care for thunderclap headaches with classic imaging findings for RCVS may be misdiagnosed as having a very rare condition called primary cerebral vasculitis, or primary CNS angiitis. Primary cerebral vasculitis is a condition in which the body’s immune system attacks the arteries of the brain, resulting in stroke. This is treated by suppressing the immune system. I have seen several patients who have been on steroids for presumed cerebral vasculitis, who actually turn out to have RCVS. There is some evidence that steroids may result in worse outcomes for patients with RCVS, so distinguishing between the two entities is very iportant. The treatment for the two disorders differs greatly. What causes RCVS? The exact cause of RCVS is unknown, but there are predisposing factors that can be associated with RCVS. Pregnancy and the postpartum state, particularly in women with preeclampsia, can be a trigger for the development of the condition. Selective serotonin reuptake inhibitors (SSRIs), frequently used to treat depression and/or anxiety, have also been associated with RCVS. The use of “vasoactive medications,” meaning medicines that can cause constriction of the arteries, can trigger this as well. This would include triptans, ergotamines (such as DHE for migraine), nasal decongestants that contain ephedrine or pseudoephedrine, certain immune suppression medications used in autoimmune disorders or after organ transplantation, or illicit substances such as cocaine, methamphetamine, ecstasy, and LSD. Cannabis has also been reported in association with thunderclap headaches resulting from RCVS. Identified triggers for the development of reversible cerebrovascular vasoconstriction syndrome. Source: Tan and Flower. Emergency Medicine International, 2012. Is RCVS a type of migraine? While approximately 40% of patients with RCVS report a history of migraines, thunderclap headaches that occur as part of the vascular constriction are not typical migraines. In fact, triptans that are typically effective in alleviating migraines can actually worsen the narrowing in the blood vessels that is occurring as part of the RCVS thunderclap headaches and should be avoided. How is RCVS treated? For many patients, RCVS is a self-limited syndrome, and the headaches will stop after several weeks. However, some patients do experience recurrence or ongoing symptoms that may warrant intervention. The first thing that must be done is to remove the trigger, if known, for what may be causing the blood vessels to spasm. If a patient is taking an SSRI, it should be discontinued. Supportive care and pain management through the period of thunderclap headaches may be enough for some patients. There are no randomized clinical trials to definitively answer the question of how best to treat RCVS, but calcium channel blockers (nimodipine, nicardipine, and verapamil are three such examples from this class) have been utilized with some success in the observational studies that are published. Magnesium may be helpful also, particularly in a pregnant or postpartum patient with eclampsia or preeclampsia. I have seen this syndrome described as “rare,” but like so many syndromes that may result in stroke in younger patients, I ask myself – rare? Or underdiagnosed? I suspect the latter. © 2018 The Stroke Blog. All Rights Reserved. held liable for any damages resulting from use of this information. All links are for information purposes only and are not warranted for content, accuracy, or any other implied or explicit purpose.